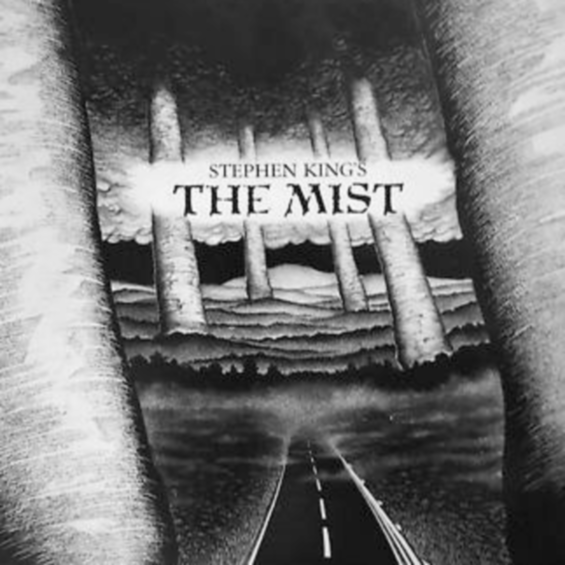 The Mist, a legendary audio dramatization based on a 1980 Stephen King novella, is available from Simon & Schuster Audio. It’s actually been available since the mid 1980s. It started on LP, being released by it’s producers at ZBS Foundation, then was acquired by Simon & Schuster to be released on cassette and later CD. Today it’s still available on CD, as well as a Audible.com download. Every time it has been re-released I’ve been reminded of how astoundingly great an audio drama it really is. 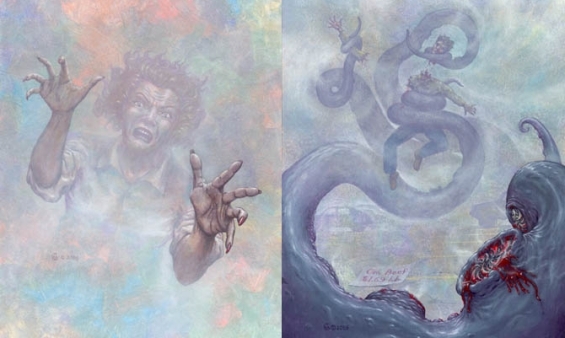 After a mysterious mist envelops a small New England town, a group of locals trapped in a supermarket must battle a siege of otherworldly creatures . . . and the fears that threaten to tear them apart. Sound so visual you’re literally engulfed by its bonechilling terror! Stephen King’s sinister imagination and the miracle of 3-D sound transport you to a sleepy all-American town. It’s a hot, lazy day, perfect for a cookout, until you see those strange dark clouds. Suddenly a violent storm sweeps across the lake and ends as abruptly and unexpectedly as it had begun. Then comes the mist…creeping slowly, inexorably into town, where it settles and waits, trapping you in the supermarket with dozens of others, cut off from your families and the world. 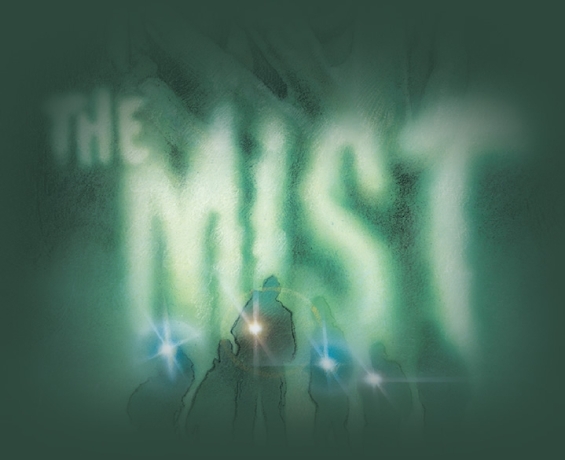 The mist is alive, seething with unearthly sounds and movements. What unleashed this terror? Was it the Arrowhead Project—the top secret government operation that everyone has noticed but no one quite understands? And what happens when the provisions have run out and you’re forced to make your escape, edging blindly through the dim light? 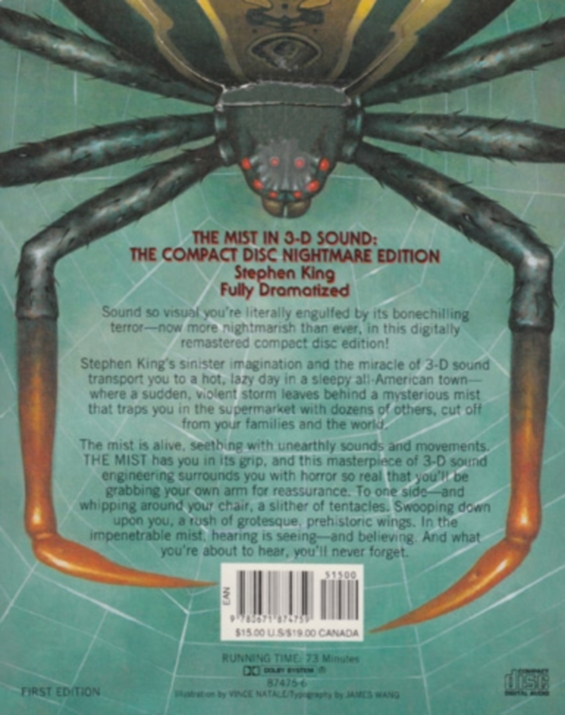 The Mist has you in it grip, and this masterpiece of 3-D sound engineering surrounds you with horror so real that you’ll be grabbing your own arm for reassurance. To one side—and whipping around your chair, a slither of tentacles. Swooping down upon you, a rush grotesque, prehistoric wings. In the impenetrable mist, hearing is seeing—and believing. And what you’re about to hear, you’ll never forget.